Jim and Judy Betlyon with one their three sons, Casey, outside their Palmer Square townhouse in Princeton, NJ. 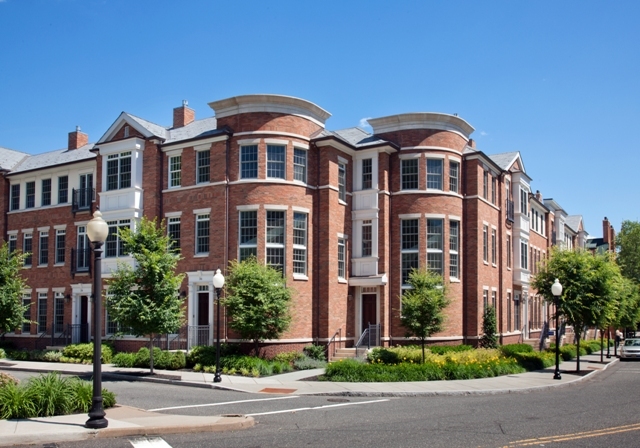 PRINCETON, NJ, might not seem the likeliest spot for those in search of an urban vibe, but new developments and a walkable core have buyers — including former New Yorkers — flocking to this college town for a taste of city living. According to numbers from Maura Mills, an agent with Callaway Henderson Sotheby’s International Realty, this year Princeton has seen an average of 28 properties per month go into contract — up from 27 a month in 2013 and 22 per month in 2012. The average sales price, meanwhile, has climbed to $980,234 — up from $933,745 in 2013 and $867,708 in 2012. And at the high end of the market, sales are accelerating even more quickly. In 2012 and 2013, Princeton saw, respectively, 66 and 92 sales close on properties over $1 million. In the first eight months of 2014, 82 such deals have closed — putting the city on pace for 123 $1-million-plus sales on the year. These properties have averaged 86 days on the market in 2014, compared to 101 days in 2013 and 127 in 2012. Of course, Princeton is no stranger to well-heeled buyers. A little over an hour from Manhattan either by car or NJ Transit, this town of around 30,000 has long been a popular, and pricey, community — both for commuters and residents associated with the namesake university. Area real estate agents have observed a change, however, in where many of these high-end buyers are choosing to settle. In recent years, growing demand for in-town properties, including several new apartment and townhouse projects, has shifted the city’s center of gravity. Proximity to downtown amenities was a key factor in the decision by Jim Betlyon and his wife, Judy, to three years ago buy a three-bedroom townhouse in the city’s Palmer Square development. This collection of office, retail and residential spaces is close to the university. After raising their three sons on 20 acres in nearby Bucks County, Pa., the couple decided they wanted something more centrally located. Not exactly a development in a hurry, Palmer Square has been under construction since the 1930s, with new parts added each decade. In 2010, the complex — which includes a 188-room hotel along with 150,000 square feet of office space and 110,000 square feet of retail — opened the Residences at Palmer Square. The newer project includes 60 two- and three-bedroom rentals (starting at $4,258 per month), 23 two- and three-bedroom condos ($1.23 to $2.56 million) and 17 two- and three-bedroom townhomes ($1.64 to $2.95 million). Daniel Scheid and his wife, Mary Beth, both retirees, purchased a three-bedroom townhouse at Palmer Square in 2010 to be closer to their daughter, who is married to a Princeton University professor. The couple previously lived in an 1830s rowhouse in Philadelphia’s Center City. “We liked that urban environment,” Daniel says of their former Philadelphia home. Palmer Square offers a similar experience, he says, albeit on a slightly smaller scale. “The number of [amenities] are far greater in Philadelphia, of course.” But, he notes, his new home is within easy walking distance of offerings like restaurants, coffee shops, museums and theaters. CAHN Communications is a full-service public relations agency that produces results for a wide range of clients involved in real estate, finance, hospitality and restaurant activities. CAHN Communications has a longstanding track record of providing proactive service and executing comprehensive public relations and marketing campaigns that garner extensive media coverage.